There once was a man called Matt. Who was blind, just like a short-sighted bat. But he could punch real fast. And he always had a blast. When he played around with his erstwhile cat. Meow! Also, he was nothing like the Writer: Mark Waid; the Artist: Chris Samnee; and the Publisher: Marvel Comics in March 2013. Allegedly. Using GENERAL terms, answer the following 4 questions about this STORY entitled 'Partners In Time'. 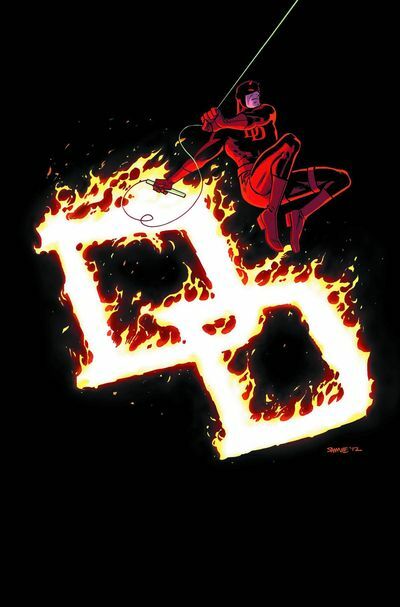 WHAT'S THE MAIN THRUST OF THIS TALE: While a horde of prisoners are forced to re-enact Daredevils origin by unnamed parties, Daredevil himself, Matt Murdock, cuts the cheese with his ill pal, Foggy Nelson, swinging from roof top to for top, before Foggy's 9pm appointment with the doc. ARE THE MAIN OBJECTIVES ACHIEVED: Yes and no. But I'm not telling you which is which because it might spoil the surprise. ANYTHING ELSE HAPPEN: Stilt-man's name is used for humor. HOW DOES THIS STORY END: With Foggy and Matt sitting in the doctors office, both very confused men indeed. Overall, what is the most memorable SENTENCE OR CONVERSATION spoken in this issue? 'My name is Matt Murdock. Brooklyn born and raised. A bookworm as a boy. Other kids called me 'Daredevil' because I was so timid and cautious. Until the one day I wasn't. A blind man was crossing the street, at the same time a truck driver was distracted by his cellphone. I yelled at the man. Deaf too, as it turns out. So I bolted at him, jet-fueled by years of pent-up fighting spirit, and slammed him out of the path of the truck. That's when the driver opted to finally look up. His tiers screaming, his cargo tumbled loose. It had been secured with the same kind of care one would expect from a fly-by-night company that thought it'd be okay to illegally transport toxic waste through New York traffic. Radioactive glow was the last thing I saw. I was blinded instantly'. Now one of the main reasons why I chose this piece, was because while I was reading it, I was presented with a first-person perspective of 'Matt's Origin'. But it wasn't from Matt's perspective. No. It's wasn't. It was a re-enactment by some bad-guys 'making Matt's' -- so to speak. I thought that was very surprising myself. As it took my (and other readers) pre-existing knowledge, and then used it to further a plot-point. (+) Honest to Romita! There is so much to like about this issue, that I don't even know where to begin. I loved the idea behind the 'bad-guys' wanting to re-enact Matt's origin so they can create an 'Army of Daredevils'. I got a right kick out of reading the conversation between Murdock and Nelson. And I almost pissed my pants at the 'Stilt man' reference when it came up. Do I have to go on? (+) Yes. I have to go on. As much as I don't say this very often, Chris Sammees work really has grown on me by the issue. At the present moment I put him up there with the best of them. A great Daredevil artist bar none. (-) Apart from having to travel to the comic shop to pick-up this title in the freezing cold weather, another thing I wasn't too keen on about this book, was the overall resolution to it. In one panel Matt muses to himself, 'It's not Foggy'. And a couple of silent panels later, the doctor say's to Foggy 'I'm sorry'. So do you see what I'm coming from, dear reader? Is Foggy, Foggy? And if he isn't, does that mean he isn't ill? TONY LIU AS MATT MURDOCK: OK, I know in the film, 'The Big Boss', Tony was the brat that Bruce Lee had to smack around to get to the big boss in question. But give him his dues though, in 'Enter The Dragon', he did allow John Saxon to punch him in the nuts. That has to count for something, right? UNICORN CHAN AS FOGGY NELSON: Whilst thinking about someone who could play Matt's pal, I suddenly though to myself 'I know! Bruce Lee's one time pal could fill in his shoes no problem at all. They both have the same cheeky face!'. 'MEMORIES ARE MADE OF THIS' BY DEAN MARTIN : Can somebody please tell me why this song popped into my head whilst I was trying to come up with a tune to compare this adventure to? I'm not sure, are you? Must be something to do with Deano-Latino's captivating voice! Overall this issue of Daredevil was CRAP. I honestly feel like I should go over to the offices at Marvel, and feed them this 'book' a page at a time. Ha! Just kidding. This book isn't crap. It's magnificent. Heck, the only reason I started off my... errr... whatever this is... in this manner, is because I think that if I praise this comic any more, it's over inflated ego may explode and then dissolve in the ether. Don't you agree with me, dear reader? Isn't this series a blast to follow? If you think so, please feel free to share the love, huh? Spam me. Share this post. Whatever. Just make it known that this book is an amazing book. Nuff said. GIVE IT, IT'S DUES: If This Comic Book Was a Burger, It Would Be One So Full of Healthy Goodness, It Could Turn Vegetarians Suicidal.